I’ve always been a sucker for a good holiday craft. Give me a few basic supplies and a few hours and I can whip you up a Halloween decoration that would make Jack Skellington himself jealous. The problem is, I don’t have a few extra hours these days. Five kids at three different schools learning three different languages and playing sports means that I’m in the car more than I’d care to admit. Enter these three simple DIY Halloween decorations! These Halloween crafts I’m sharing today require no fussy cutting since they’re made with a Cricut machine (can I get an amen! ), are downright adorable, and can be made faster than you can say “headless horseman.” Okay, almost faster. If you’re throwing or attending a Halloween party, even better! These DIY Halloween decorations will take your soiree from standard to sensationally spooky in a few short minutes. Each of these DIY Halloween crafts is made with a Cricut Maker. 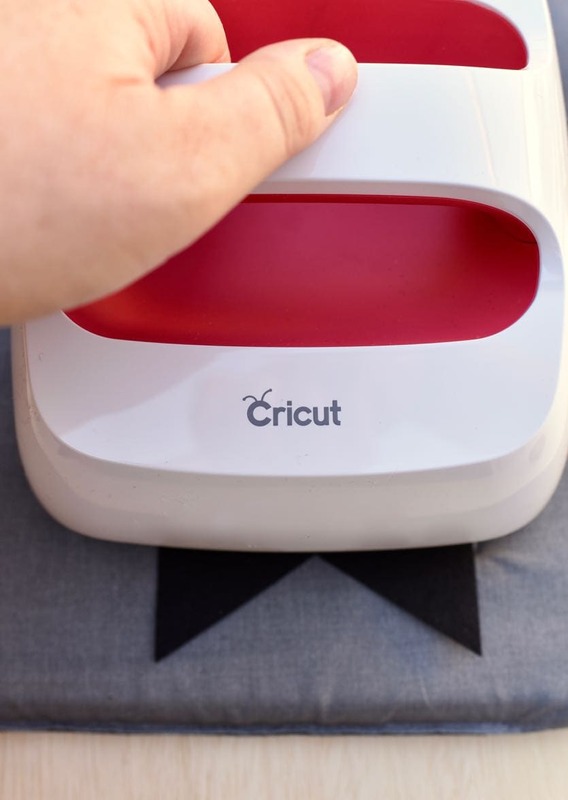 What’s a Cricut Maker you ask? 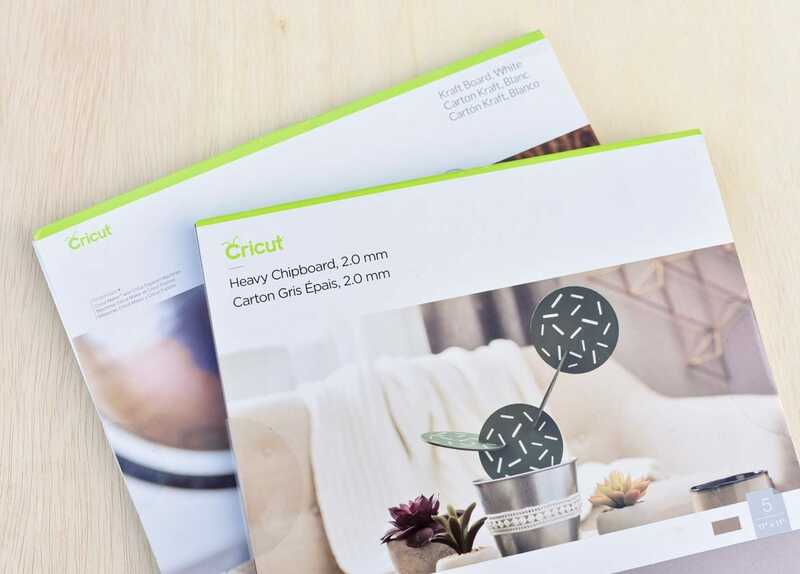 You can learn all about why you need a Cricut Maker in your life in the post I shared, but basically it’s an amazingly powerful cutting machine. 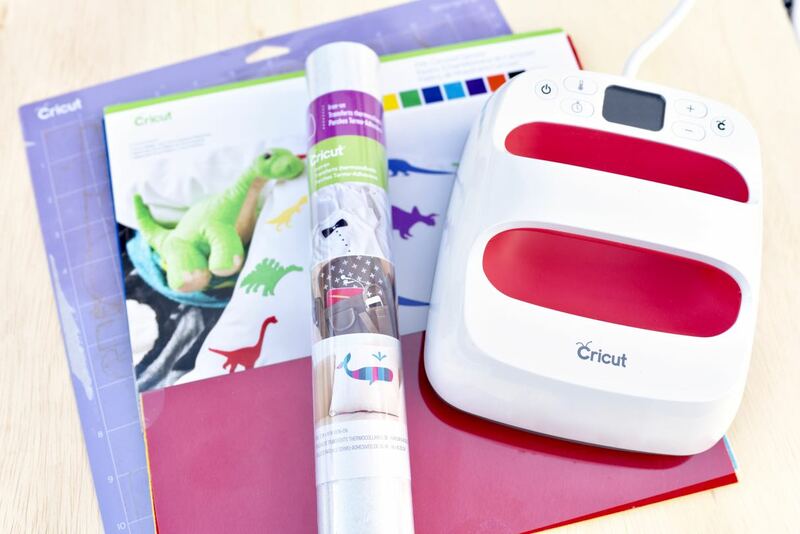 The Cricut Maker can cut everything that the Cricut Explore machines can, plus a whole lot more. Thick chipboard, leather, balsa wood, felt, mat board, and even fabric are not match for the Cricut Maker! The machine comes with a powerful Rotary Blade that cuts through virtually any fabric, and uses the Knife Blade, Scoring Wheel, and Double Scoring Wheel to cut through multiple materials. 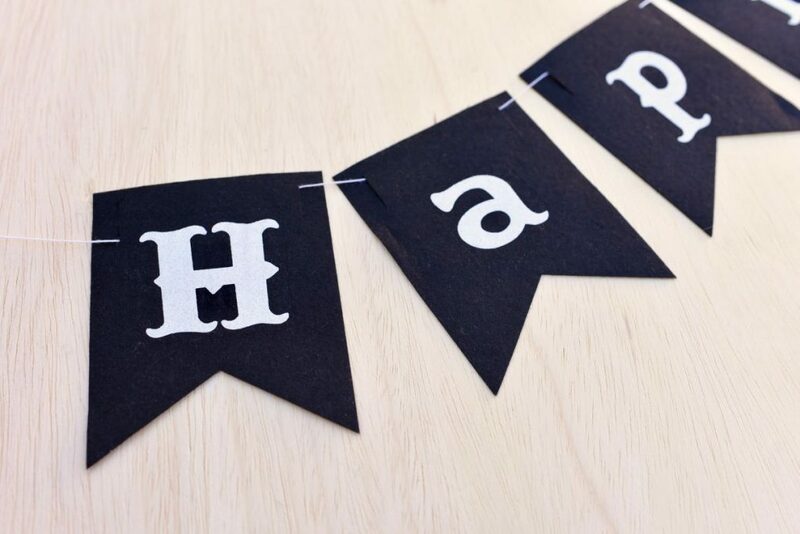 Make a darling black felt Halloween banner with glitter white “Happy Haunting” iron-on letters. Step 1. Click HERE to go to the cut file I created in Design Space. Turn on the Cricut Maker machine, and place a piece of black felt onto a Cricut mat. Press the “felt” option. I prefer to use the Rotary Blade when cutting felt, so I edit the tools on the screen to use the Rotary Blade. Press the flashing arrow button to load the mat, then press the flashing “C” button to cut the felt banner pieces. Once the machine is done cutting, press the flashing arrow button to unload the mat. Repeat the process to cut the white glitter iron-on letters. Step 2. 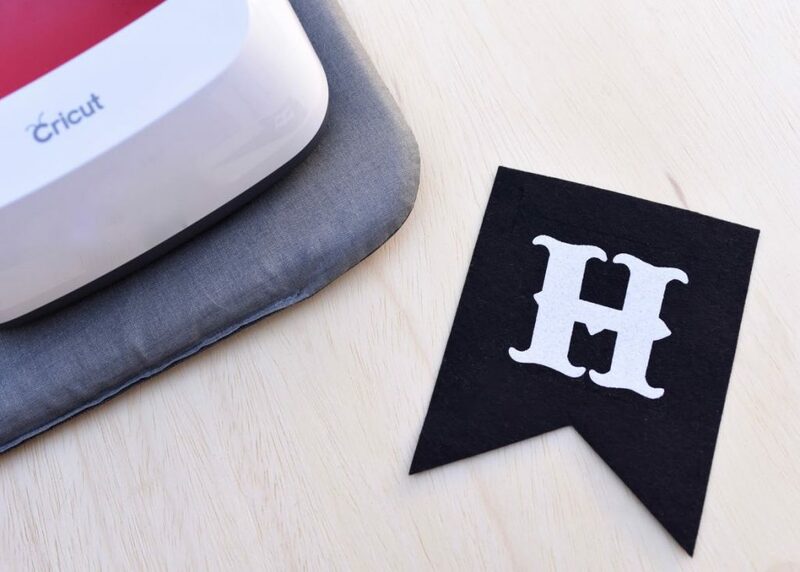 Remove all the excess felt and iron-on from your designs, then cut around each letter to separate them. Turn on the EasyPress 2 to the correct temperature for your material. You can find an Interactive Quick Reference Guide HERE that will tell you the proper settings for the materials you are using. You guys- the EasyPress 2 is amazing! I have the smaller size, which was just perfect for adding iron-on to this banner. It’s also great for baby onesies, hats, accessories, and smaller projects. The EasyPress works so much better than an iron and is incredibly easy to use, especially when crafting these easy DIY Halloween decorations. For glitter iron-on on felt, I set my EasyPress 2 to 270 degrees. First, pre-iron where the iron-on will go for 5 seconds. Then, place the iron-on right-side up with the clear sheet on top where you would like it to go on the banner. Place the EasyPress down over the letter and hold firmly in place for 30 seconds. Just press the timer button and it will beep when the 30 seconds is up! Then turn the banner over, heat the back for 15 seconds, then flip back over. This Halloween banner is a warm peel, which means that you wait until the design is warm (not hot, not cold), then peel off the clear layer over the top. Ta da! Repeat for each of the letters. 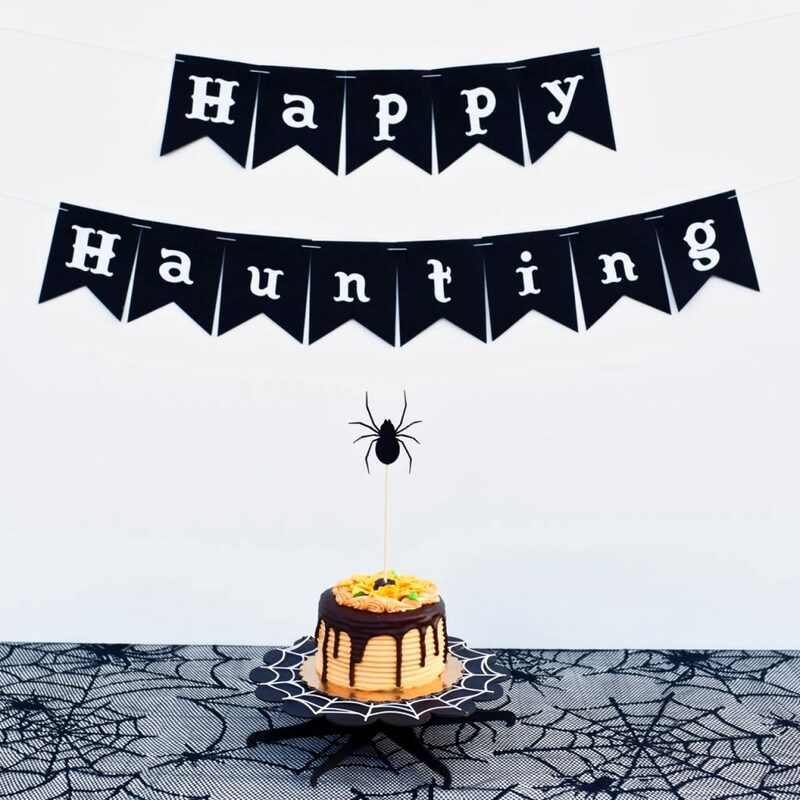 Add string to your Halloween banner by weaving it in and out of the slits that the Cricut Maker cut in each banner. This makes it so easy to assemble! 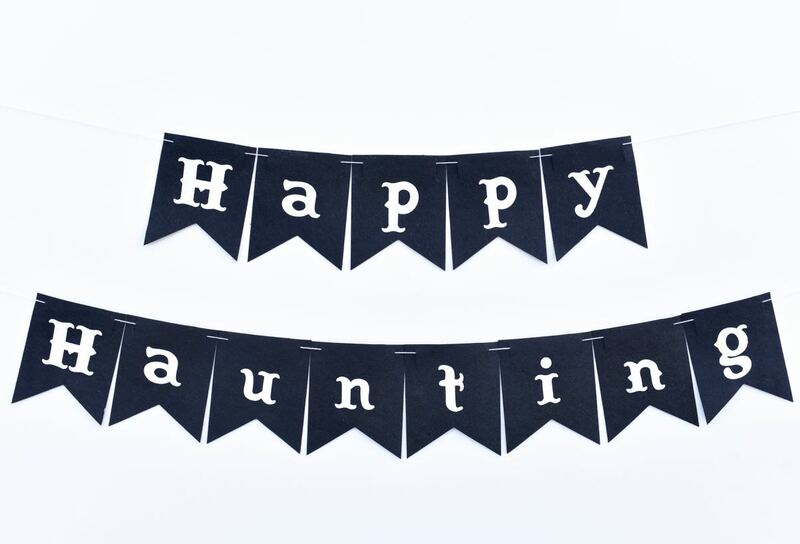 Now you’ve got a darling Halloween banner that is easy to customize, easy to hang, and looks just like you bought it! A darling spider cake topper that has a vintage feel to it and would be perfect for topping any Halloween dessert! If the cake topper is topper is the size you would like it, click “Make It.” Choose “Felt” in the cutting surface menu. 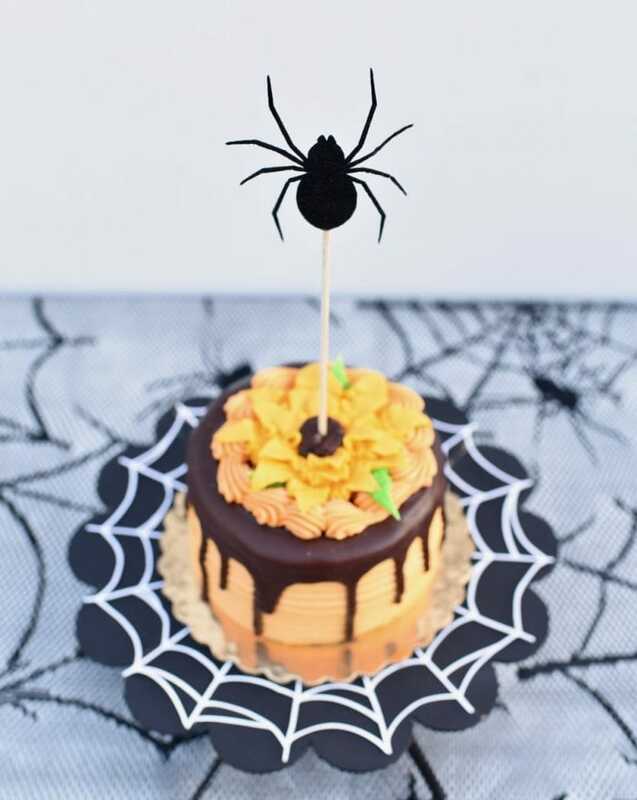 I used felt because I wanted the spider cake topper to have some texture and look a little fuzzy. 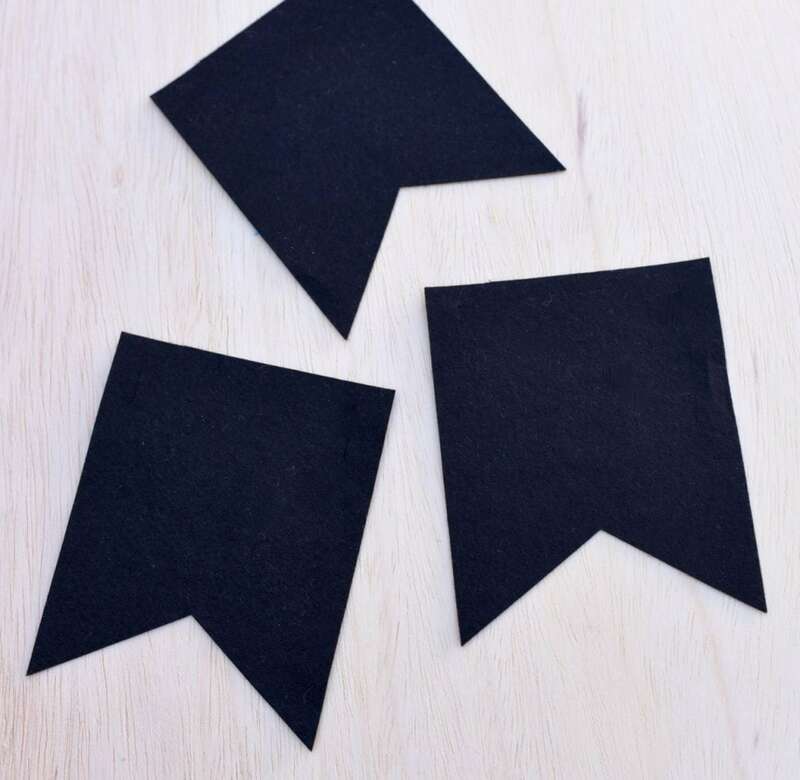 Place a piece of black felt onto a cutting mat. Follow the prompts to the felt cake topper. Once done cutting, press the flashing arrow button to remove the mat. Remove the Halloween cake topper from the mat. Step 2. Glue the topper onto a wood skewer. 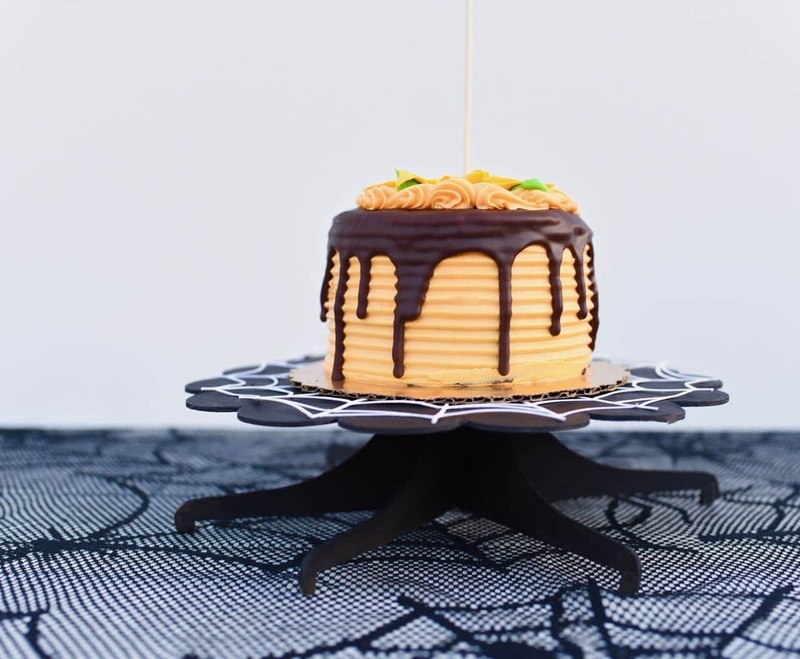 Now just stick your cute new Halloween cake topper right into the top of your cake! Isn’t this one of the cutest DIY Halloween decorations? 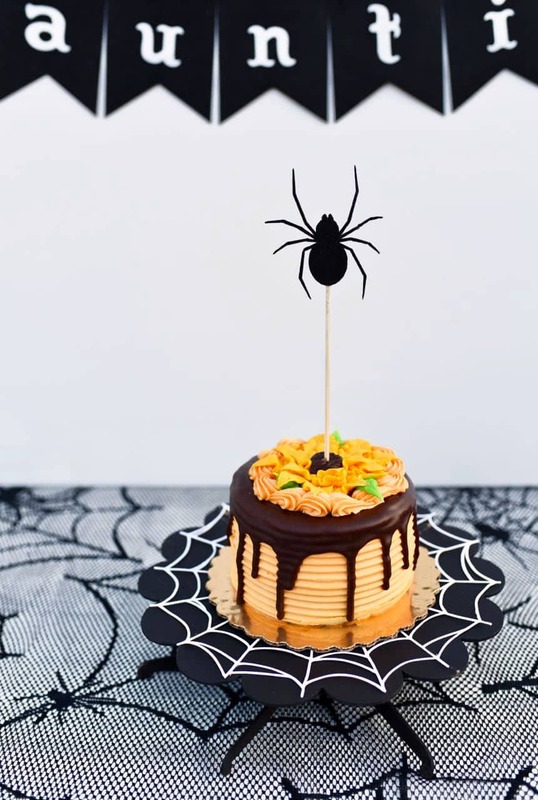 A spooky black cake stand with an intricately cut spider web on it is the perfect way to display Halloween treats. Click “Make It.” Choose “Chipboard” in the cutting surface menu. 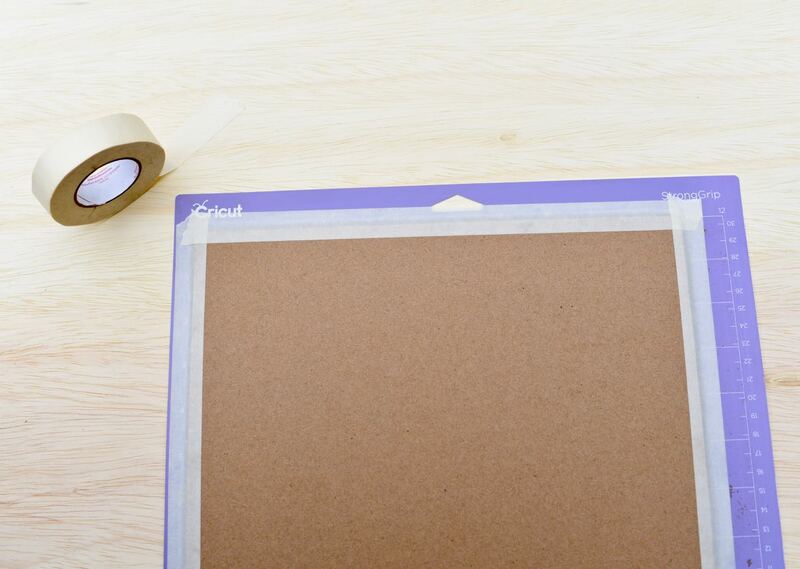 Place a piece of chipboard onto a purple Strong Grip Cutting Mat. Place a long strip of masking tape on each side of the chipboard to secure the chipboard in place. Follow the prompts to cut the chipboard for the DIY cake stand. You’ll be using the Knife Blade to cut through the chipboard. The machine will be using multiple passes to cut the chipboard, since it’s so thick. Once done cutting, press the flashing arrow button to remove the mat. Remove the chipboard from the mat. You will need to repeat this step for each piece of chipboard so the machine can cut out all the pieces. Be patient! The machine may take a few minutes for each piece of chipboard. It has to go over each piece multiple time to cut through the thick chipboard. 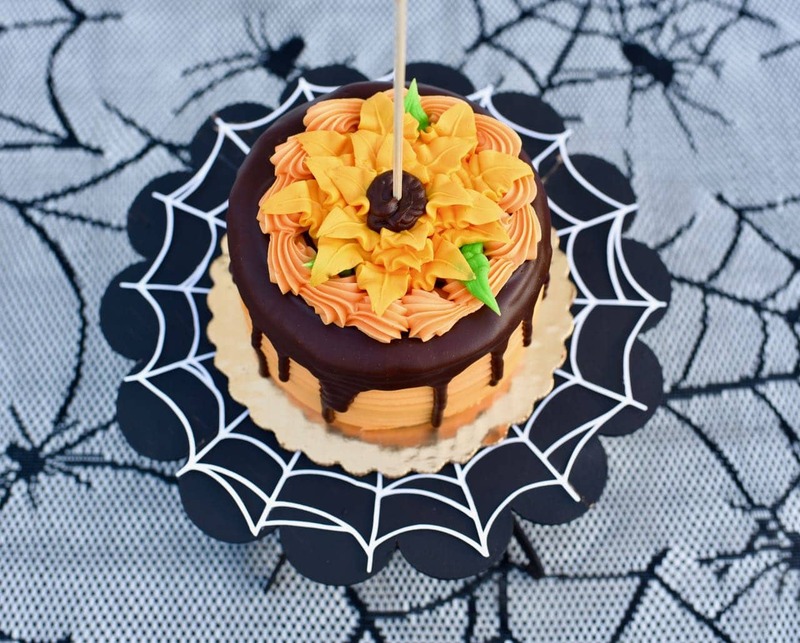 Use white kraft paper or cardstock to cut out the web top for the cake plate. I used my TrueControl Knife to make a cut in one spot where the machine didn’t quite cut all the way through, which worked really well. Step 2. Paint a coat of Mod Podge over the chipboard to seal it so it will take the paint well. Paint the DIY cake plate pieces the color that you would like, then let dry. I painted mine black. Step 3. Assemble the cake plate by putting all the pieces together. How cool does that white web look on top of the black cake plate? 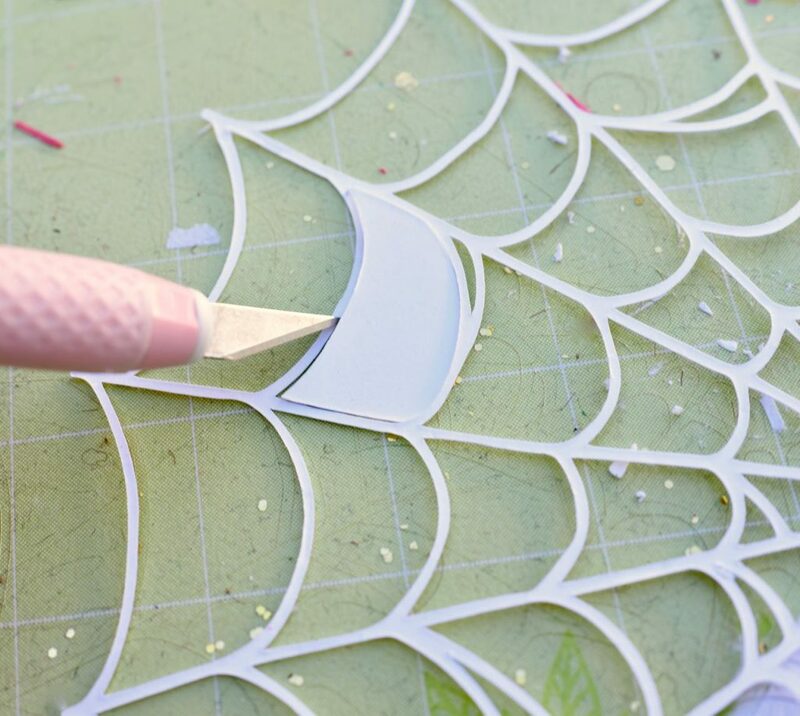 The web is so thin and intricate and the Cricut Maker cut it out perfectly! 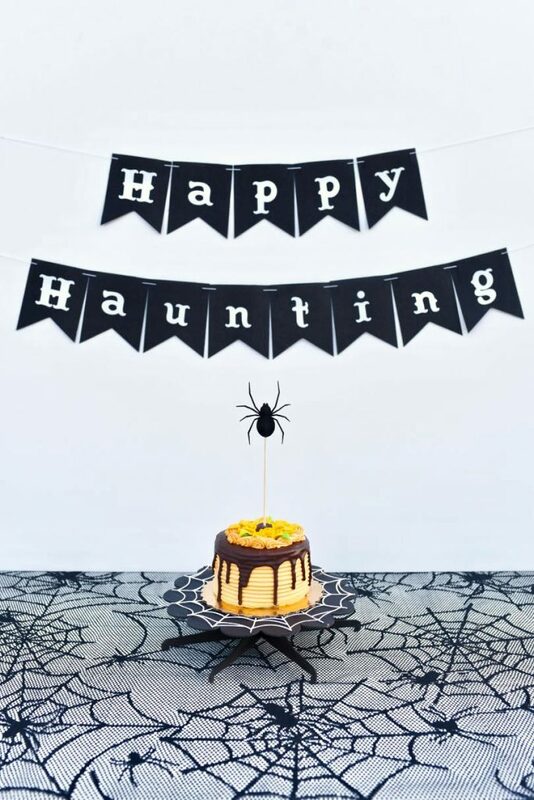 Now just add a cake to the top, add the cake topper you just made to the top of the cake, hang the Halloween banner behind it that you just made, and you’re ready to party! 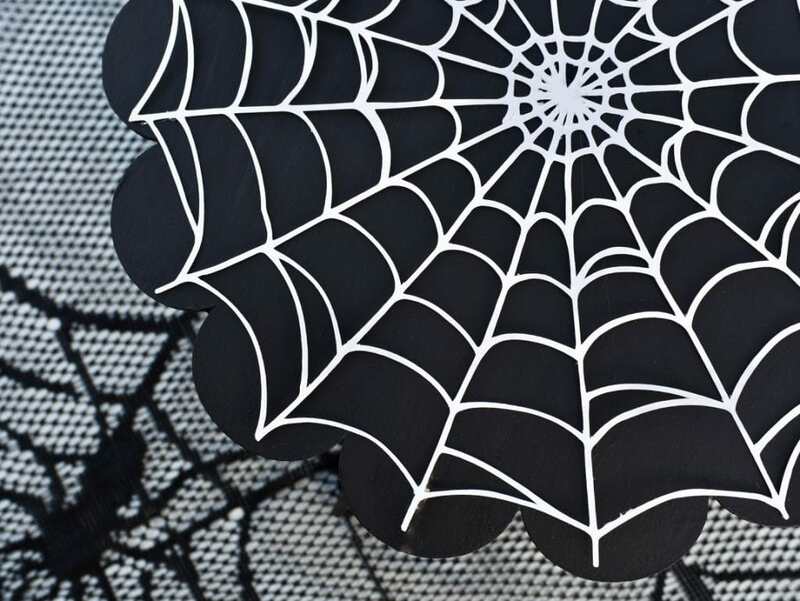 And now even Jack Skellington is green with envy over your amazing DIY Halloween decorations.